Last week was Boston FIG, our favorite indie game festival. We talk favorite games and impressions, with special guest co-host and staff writer Corey Lagunowich. As in past years (2017, 2016 digital, 2016 tabletop, 2015), we couldn’t see everything. Instead, we’ll tell you about our favorite games of the festival. We noticed a lot of derivative games. What held our interest were games that did something unique or games that did something very well. And, it goes almost without saying, we stuck to games that were family-friendly. 39 Days to Mars – 2D, Myst like in that it doesn’t hold your hand. Very few visual clues. Victorian steampunk theme, cooperate with another player to build a rocket to get to Mars. Most puzzles absolutely required both players’ cooperation with simultaneous action. Squatbot – 2D platformer, already available free for mobile devices. Simple but not easy; feels smooth and natural, nicely polished. Play either in infinite mode or level-by-level. FUR – First-person game. Free the furballs, then throw them at various kinds of obstacles. Designed by a student team. First showed at PAX East, with linear level design (too easy); re-did the level design for Boston FIG to include lots of backtracking, making it much more compelling. Flock of Dogs – local cooperative for up to 8 players, still in early development. Odd theme (flying dogs, flying whale, etc) but very family-friendly. (16:00) We noticed a lot more local multiplayer than previous years, and more player counts higher than four. We noticed this last year in King of the Hat, and we’re glad to see even more now. Chibisu’s Costume Combat – top down 2D multiplayer battle. Pick a costume at the beginning of the round, and that determines your attack style and special powers. Save Your Nuts – another top down battle, but in teams. Basically a capture-the-flag. Less chaotic than I thought but also harder than I thought. Reminds me of Rocket League, in that the action went just a little bit too fast. Winner of “Figgie” for Multiplayer and Connected Games. Exposure, which we saw last year and liked a lot, won the “Figgie” for Experimental Game Design. Where we spent most of our time (as usual). 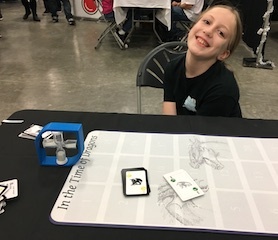 The tabletop showcase had a lot of games with great staying power. Born to Serve – from Shoot Again Games. Players are a bunch of second-rate super heroes, competing for the last job in town – a waiter. Don’t use your superpowers… when people are looking! slated for Kickstarter 2019. Luke Warm (Figgie for Most Innovative) – 4 player asymmetric game, still in paper prototyping stage. “Luke” is trying to cross the circular board to get from start to home, and cannot see the board for most of each round. “Wind” is trying to freeze Luke; “Sun” is trying to make Luke hot… and “the Bears” want to eat him – but only if he’s the right temperature! The three non-Luke players are semi-cooperative because none of them want Luke to get home, but are also competing to get their own personal goal. Really neat because the asymmetric gameplay allows for several difficulty levels simultaneously. VISITOR in Blackwood Grove – from Resonym. “Green Glass Door”, the board game. Asymmetric; play as “the kid”, a government agent, or the alien. Alien chooses which objects can get passed through the portal. Kid and agents try to guess what the objects have in common, but Kid and Alien are working together. (Box glows in the dark!) We got a copy for review, and we’re looking forward to playing it more, and trying the different roles. 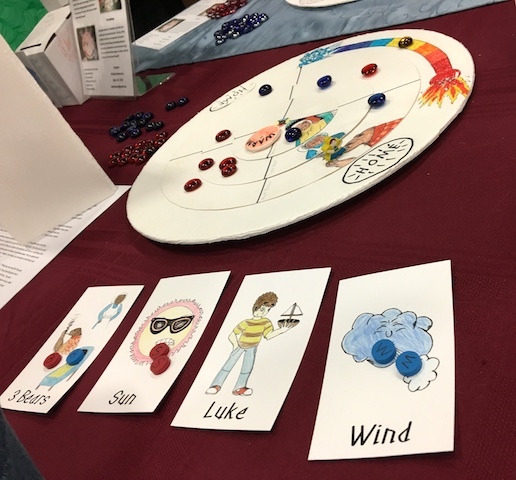 In the Time of Dragons – this is a game David Wilkinson told us about when we talked to him in January. He’s got a great theme for it now – dragons battling each other! Play cards at “moments in time” to attack and defend, but play quickly so that your time doesn’t run out! Play more cards to earn more “glory”, but if your opponent over-matches you, you’ll take that much damage instead. Win by accumulating more glory – as long as you’re still alive when your cards and time run out. Each round is exactly 2 minutes long, and an entire game takes 10 minutes or less. Bird Wiser – UNO-like but instead of matching on numbers and colors, you’re matching bird attributes. Oversized cards allowed for textbook-style detailed art. Whale Rescuers – by Environerd Studios, this looked really cool. Build a cardboard whale and entangle it. Play enough cards cooperatively to free the whale. Beautifully hand-crafted, educational, and fun. Penguin Slap – card game made by professional visual effects artists, very charming. You are a penguin trying to “slap” other penguins so they drop all their fish. Currently on Kickstarter, and fully funded. Our friend Andy Geremia was there with Sports Dice again this year. This year’s version is football, and it goes incredibly fast compared to Sports Dice: Baseball. YARDS, the Game of Inches – football meets Onitama. Board is segmented like a checkerboard. Red vs blue, plus one white pawn as “ball carrier”. Play cards that show a pattern of specific movements (many were formation cards that require a certain orientation of pawns to be able to play). We thought it was great. You can purchase it directly from the developer. Asher is working his way into beating every developer of Fire Tower at their own game (as per our interview with Gwen & Sam in May). We can’t wait to get our copy. Jeff Johnston seemed to be having a lot of fun with Leaf Me Alone, a game of “raking” up leaves for points and then catapulting them back into the pile at the end of each round. Stephen Duetzmann told us about That’s Wizard from CT FIG, and it looks really cool; a head-to-head battle of wizards. Heavily influenced by Harry Potter, but unfortunately our kids weren’t interested. Crumbs – (Best in Show) really complicated, not family-weight. Slap Down! (Audience Choice) – by Wild East Games. Thanks to Brian Bollinger who showed Elliot a kinder, gentler version. 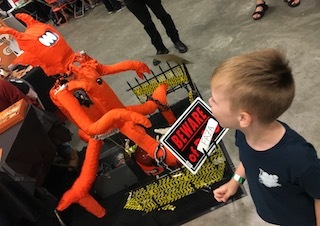 FAZA (Best Hobby Game) – Elliot loved the mechanical alien. Really neat concept of “tower attack”, but very hard to win. Recommended for 13+ because of the difficulty. Hibernation (Best Family Game) – we’re sad we didn’t get a chance to play this one. D.N.Abled (Best Game In Progress). Best in Show, Audience Choice, Innovation, and Compelling Game Mechanics were all to games that didn’t appear to be very family-friendly. EXPOSURE (Best Experimental Game Design) – we liked this a lot last year. Save Your Nuts (Best Multiplayer and Connected Game) – as we mentioned, chaotic, fast, and fun. PLEASE don’t forget to subscribe to the show, tell your friends about the show, and leave us a review at Apple Podcast or whatever your podcast subscription source is. We’re now on TuneIn.com! 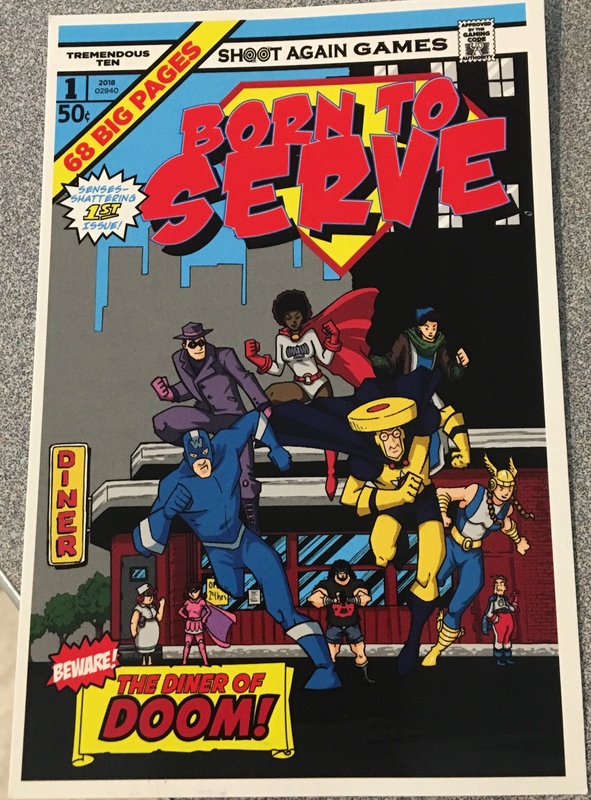 Thanks for mentioning Born to Serve! It was very nice to meet and talk with you. Great podcast. Thank you for mentioning BirdWiser. It was great meeting and chatting with you at Boston FIG! BirdWiser is still on Kickstarter until November 28, 2018. Fun episode! It’s like we were there with you. Although, I will note I prefer “hook” over “gimmick” on the Leaf me Alone game design!